This is a scene from a prototypical Vermont village – that of Weston Vermont. Despite the look of the sunlight and the deep summer greens, the temperature was quite cool at set up time. It took a couple cups of coffee from The Vermont Country Store to keep me moving! This painting features a wide range of greens all of which are mixed from various blues and yellows from my palette. Once trees, shrubs and grasses have grown and matured, the summer landscape can take on a fairly uniform – and therefore monotonous – color of green. The solution for the painter, is to look for variations in color. There are actually many subtly different greens in different varieties of trees and plants. The effect of light also creates various changes. And then there is artistic license! Consciously deciding to make a change in a painting for the sake of design and theme is an important skill. It is also true freedom. In the case of this painting, a number of the green tree shapes were darkened to help simplify and unify the shape and to create areas of value contrast. With all of the green, many of them vertically oriented shapes, there seemed to be a need for some additional visual contrast, so the horizontally oriented roofs of the two buildings, along with the two utility poles and tree trunk in left-center were painted with low-intensity reds. 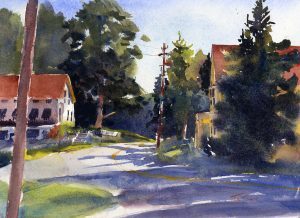 Hopefully this painting convincingly conveys a summer morning in a prototypical Vermont village – that of Weston Vermont.